AERIAL is a destination hospitality events venue, designed for Food and Desire, one of Melbourne’s leading event specialists. Situated at South Wharf, it is a large-capacity offer overlooking the Yarra with panoramic city views. The overall planning and programming was an exercise in maximising space and pre-empting multiple function types and layouts. A major challenge was to design for the diversity of events; creating the infrastructure to facilitate quick and radical changes in character required for weddings through to corporate launches. 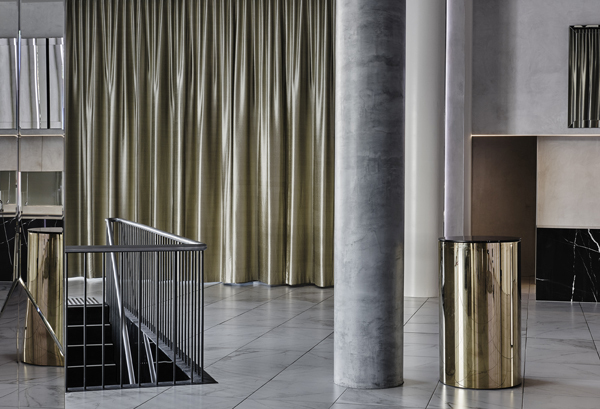 Spatial drama is created through an atmospheric arrival space at ground level with a monolithic stair drawing guests up to the main function space. Arriving at the first floor the spectacular views of the river and city are revealed. The Aerial site was inherited as a half constructed concrete shell with existing apartments above. This posed a number of structural and acoustic constraints. The brief was to deliver the venue in 10 months which required rigorous co-ordination of interior and architectural design. The client expectation was of an extremely durable space that was still elegant and finely detailed. The entry to this elevated venue is found at ground, it is brooding and atmospheric. 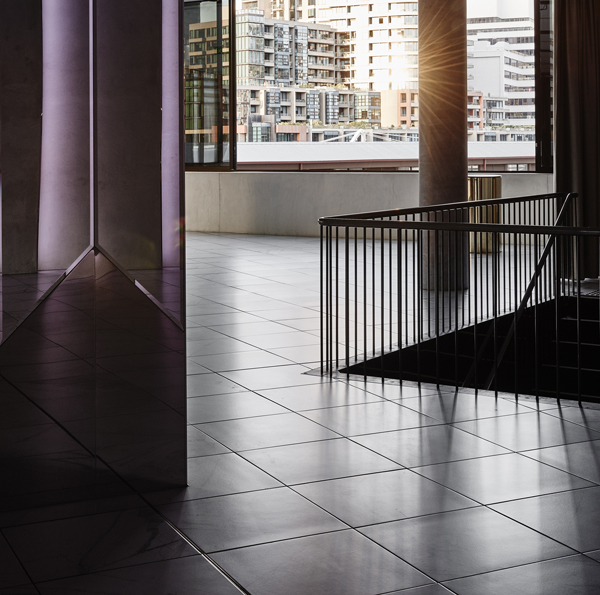 The forty-three stepped black concrete stair, formed and poured in situ, forms the focal point, with a tinted glass façade and black steel stair balustrade and lift cladding. 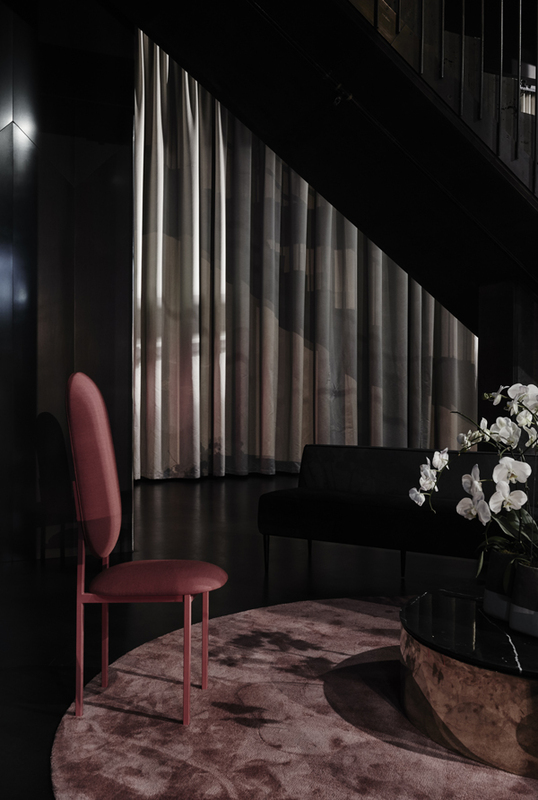 A five metre drop of the silver curtain and Bec-Brittain pendant delicately complete this entrance. The 45m2 ground floor serves dual purposes of arrival and back of house storage. The staircase was a major challenge threading carefully through existing concrete structure. 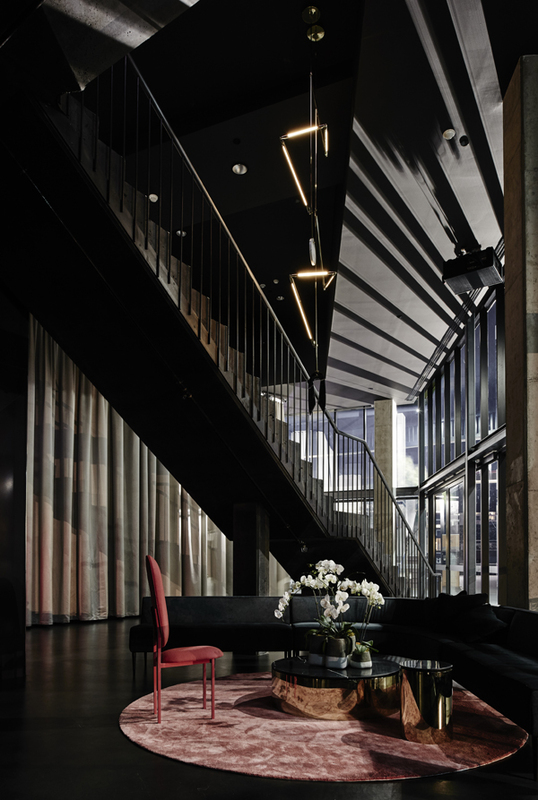 Ascending the cast stair is an expansive 700m2, function space, it is split into two main areas: the arrival bar and restaurant. 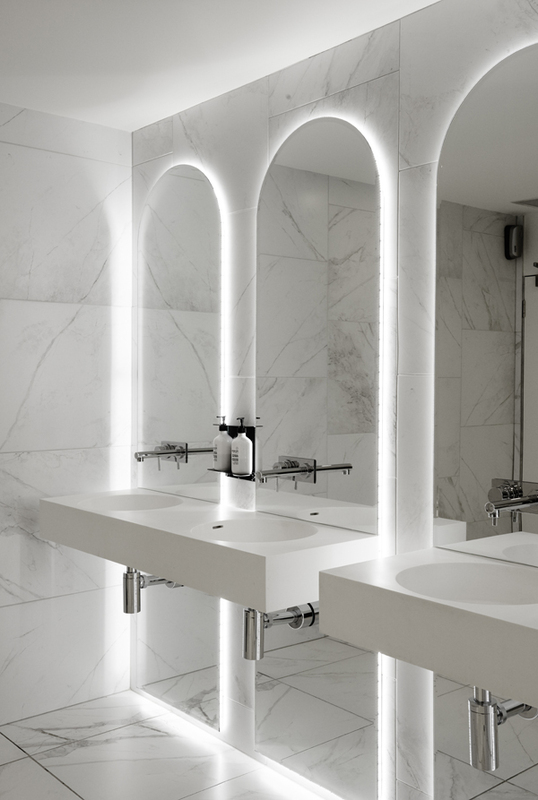 Arrival is the first impression likened to a grand holding room with accents of marble, mirror and reflection. Pre party /dinner drinks are screened from the main room with full height moveable 4 meter gold and silver curtains. The concrete pleated LED wall is programmable to allow infinite variations of mood from day through to night. The view can be withheld from arriving guests, to be revealed when the moment is right. Once drawn, extensive glazing and high ceilings offer generous east west cityscape views. The façade is made up large glass sliders to achieve openable sections for connection to outside. There are no balconies although when at the window you feel like you are standing at one. 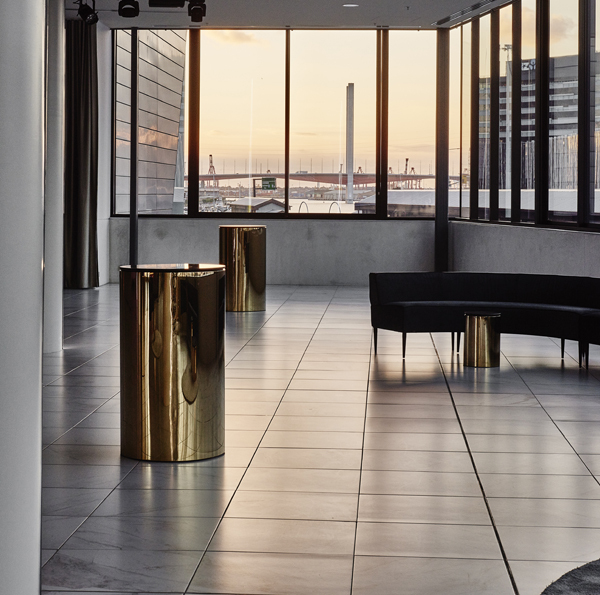 The first floor function room area is supported by the commercial kitchen and amenities, including office mezzanine, plant, toilets and furniture store. The original lift was a visual black hole. It remains, but has been clad in bevel edged and chamfered mirror, reflecting the view in new and interesting ways.